Outlined below are the key features and specifications for the Dodge A100 nameplate. This includes the classic Chrysler marketed facts and figures along with technical data and dimensions from original brochures and advertisements. Listed below is a basic breakdown of facts and features. This is a general overview. The Pickup and Van were both made available with basically the same engine and transmission options throughout the six year production run. 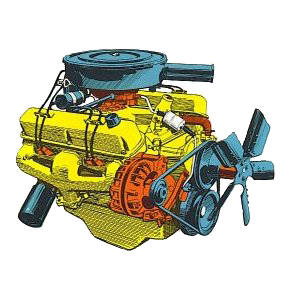 The A100 was first introduced with engine choices of a 101 horsepower 2.8L or 145hp 3.7L Slant 6. Available transmissions were an optional dash-mounted “LoadFlite” three speed automatic along with standard and heavy duty 3spd manual synchromesh column-mounted “3 on the tree” options. Listed below is a timeline of various A100 engines used during its production run. You will find it common among A100s listed for sale today to have engine modifications or swaps. 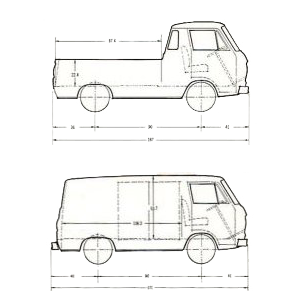 Fore more detailed features and specifications including standard equipment for both the pickup and van check out our Dodge A100 Brochure page. I have a 1965 Dodge A100 Van with a V8. How can I tell if I have a 273 or a 318 in my van. It looks like the 65 only came with a 273 that year.